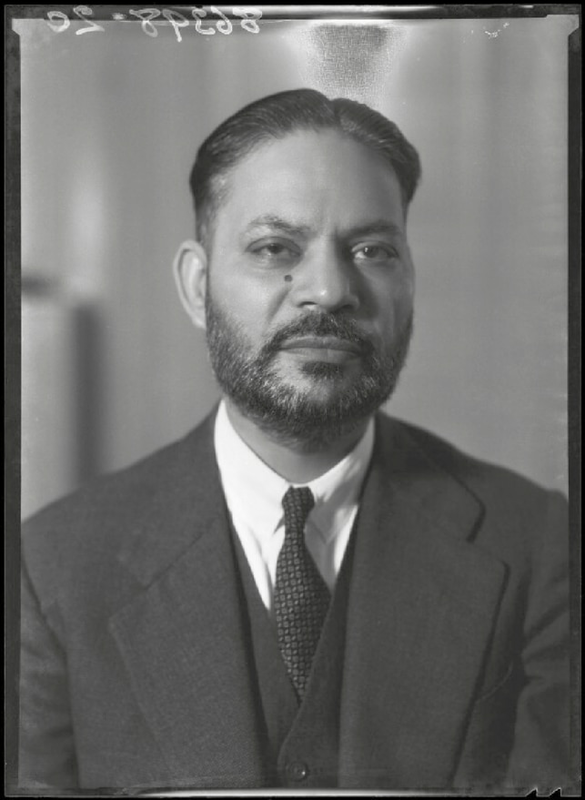 Hazrat Sir Chaudhry Muhammad Zafrulla Khan, may Allah be pleased with him, was abundantly blessed with good qualities and distinctive attributes. A lot has been written about him and a lot more will be written in the future. In this article, rather than giving a biographic account of his outstanding achievements and services, I would like to write down some anecdotes and impressions based on my personal observations and experiences. I would like to do this for the benefit of the younger generation, who did not have the opportunity to see him during his lifetime. This is an attempt to make the younger generation develop at least some understanding of the strength of character and grandeur of Hazrat Chaudhry Sahibra. By the time I reached the age of discretion, Hazrat Chaudhry Sahibra was very well-known as a great man and a wise leader throughout the world. I had the pleasure of listening to his speeches during Jalsa Salana. He was extremely eloquent, and his delivery style was unique. He had the uncanny ability to explain even the most complex concepts in an easily comprehensible manner. This simplicity in his expression made his speeches accessible to everyone. That is how I came to know him initially. My first direct contact with him, that I vividly remember, was when my late father (Hazrat Maulana Abul Ata) invited some respected members of the Jamaat for dinner to his house named “Bait-ul-Ata”in Darur-Rahmat Wasti, Rabwah. Chaudhry Sahibra was one of the guests. When Chaudhry Sahibra was about to leave, my father told me to accompany him to his bungalow in Darus-Sadr Gharbi. Thus, Chaudhry Sahibra and I set out on foot. Because of his towering personality and my extreme reverence for him, I was hesitant to speak. However, Hazrat Chaudhry Sahibra talked in a relaxed manner about several things. I realised that he had a very affectionate, relaxed, calm and simple disposition. At one point, he took hold of my upper arm and upon observing how lean it was, he remarked, “Is that all?”. When we finally reached his bungalow, Chaudhry Sahibra thanked me, and I requested him for his prayers before leaving. This short meeting only lasted 15-20 minutes, but it left a pleasant and lasting impression on me that I relish even today. 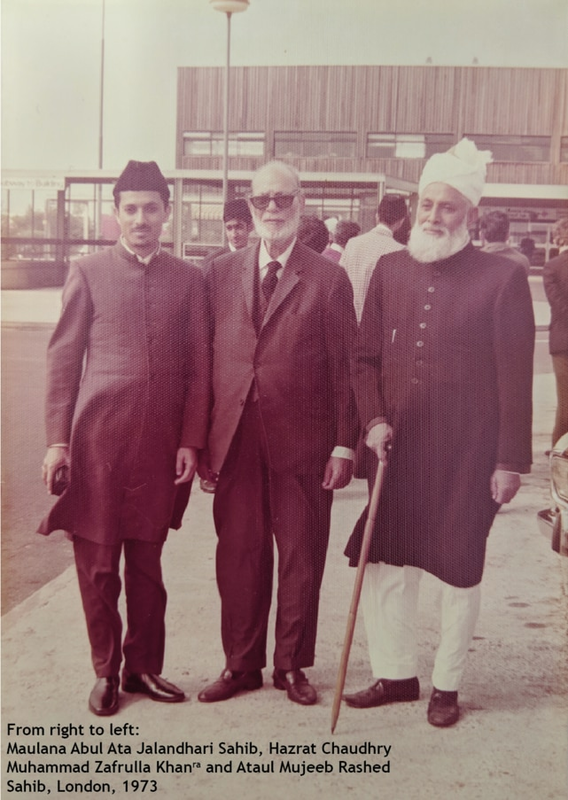 When I arrived in London as a missionary and deputy imam in September 1970, I had the opportunity to meet him regularly. I hereby present some anecdotes relating to that period which illustrate various aspects of Chaudhry Sahib’sra pleasant personality. This was my first venture outside Pakistan, it was the first time for me to travel by air through the blessing of Ahmadiyyat. I had studied English language at school and college but never needed to write or converse in English while in Pakistan. I had delivered some prepared (and memorised) speeches in college and Jamia, but my English was not proficient for day-to-day conversation. I mention this because two months after my arrival in London, I was subjected to a test in English and the examiner was none other than Hazrat Chaudhry Sahibra. It so happened that the late Bashir Ahmad Khan Rafiq Sahib, the then Imam and missionary in-charge told me once that someday I would be required to deliver a Friday sermon in English. I expressed my opinion that there was no rush for that and in due course such opportunities would, God-willing, arise. That, I thought, was the end of the matter. A few days later, on Friday, I had offered my sunnah prayer and the second azan was called shortly afterwards. Khan Sahib, who was sitting next to me, nudged me to get up for the sermon. I was not mentally prepared for that, but there was no room to make excuses as I could not engage in discussion with the mosque full of worshippers. I had to get up. With prayers, I started the sermon with Tashahud, Ta‘awuz, and Surah al-Fatihah. That much was easy enough. As I looked around, I saw Hazrat Chaudhry Sahibra seated in a chair as usual towards the right of the first row. As he heard the voice of a new speaker, he glanced at me. I am sure he would have prayed for me, but I was awestruck by his personality. Just then, I remembered the farewell advice by Hazrat Khalifatul Masih IIIrh as a flash of inspiration. He had advised me to speak English confidently and without hesitation while in London and not to worry if I made mistakes in the beginning. That encouraged me and I bolstered my morale thinking that Chaudhry Sahibra had also progressed to his current standard of excellent English gradually. These ideas passed through my mind over a short time. Putting my faith in Allah, I started the sermon. I do not remember the topic, but it lasted for 15-20 minutes. After Khutba-e-Saniya [the second part of the sermon in Arabic], I led the prayers. After that, I offered the sunnah prayer and spent longer than usual offering these. I was hoping that Chaudhry Sahibra would have left by then and I would not have him hold my arm and point out my mistakes in front of all the people. After the sunnah prayer when I got up to go, I saw that Chaudhry Sahibra was still engaged in prayers. It was an opportune moment for me to leave the mosque immediately. Now I waited for the result of my test and expected to receive guidance from Chaudhry Sahibra shortly. In the evening when I met Bashir Rafiq Sahib, he congratulated me. “For what?” I asked. He replied, “Chaudhry Sahib has given you a pass in English.” I said, “Alhamdolillah” and thought that he must have added some grace marks out of his magnanimity for the new speaker on his first attempt. His kindness and graciousness to me continued later in various ways. Allah the Almighty had blessed Chaudhry Sahibra with countless blessings and honours. He had been to great palaces and chambers of the world and had met great personalities. However, by nature he was a very humble person. Simplicity and dervish-like nature were the salient traits of his life. For one, he was very frugal in spending on himself but very generous in spending in the way of Allah and in helping the poor and the students. For instance, whenever he went to Central London via the District line, he used to walk to East Putney Underground station instead of Southfields station. He would take this longer walk, so that he could save on the tube fare, which was probably one penny saving. Generally, most people living in the area started their journey from Southfields and did not care for the tiny difference in the fare, giving preference to their comfort. Hazrat Chaudhry Sahibra used to save one penny per travel; he mentioned it to others and urged them to do the same. I clearly remember him telling in his speeches that people used to argue with him as to what did he save by doing so, to which he replied, “One penny.” They would then ask what benefit he got. He would reply again, “One penny.” Hazrat Chaudhry Sahibra used to relate this in detail. He used to narrate in his style that though apparently it was a saving of one penny only, but continued savings like that would add up to hundreds and thousands of pounds. His style of counseling was very effective. At the same time, his excellent personal example of spending generously in the way of Allah was apparent to everyone. He had established an institution by the name of Southfields Trust to help the needy and deserving students and the less privileged. Stipends were given out as interest free loans or as aid. That was a great service and ongoing charity. Additionally, there was a whole network for the help of the needy. Generally, he helped people in such a discrete way that others would not know about it. I had the opportunity of working as a member of this trust for some time and was inspired by this aspect of Chaudhry Sahib’s character. A proposal was once under consideration that the then existing two buildings that were very old in the Jamaat UK centre be demolished and replaced by a large complex comprising of a big hall, offices, two large residences and a small flat. However, the Jamaat did not have the necessary funds for the project at that time. It is not the Jamaat’s policy to take bank loans on interest. Hazrat Chaudhry Sahibra was requested to lend the amount, which would be paid back to him in instalments over a period of time. He agreed. In accordance with Quranic teachings, a contract was drafted to the effect that Chaudhry Sahibra would pay the Jamaat £100,000 and the Jamaat would be responsible to pay it back. The draft was shown to Chaudhry Sahibra one evening. He said that he would study it carefully, sign it and return it the next day. Saying that, he tore up the draft, wrote a cheque for £100,000 and presented it to the Jamaat. He pleaded that this donation should not be mentioned to anyone in his lifetime other than Hazrat Khalifatul Masih IIIrh. What an excellent example of sacrifice, humility and sincerity! In the context of this building, I would like to mention another magnificent incident. The foundation stone of the building was laid in 1967 and it was completed in 1970. Hazrat Chaudhry Sahibra requested the Jamaat to allow him to reside in the small flat on the second floor whenever he needed accommodation while in London. Hazrat Khalifatul Masih IIIrh happily granted permission. The flat was small. I had the opportunity to go to the flat several times and see it closely. Albeit small, it was enough for Chaudhry Sahib’sra limited and simple needs. It comprised of a small bedroom, a compact kitchen, bathroom and a medium-sized sitting room which doubled up as his study where he spent most of his time. He had a modest sofa set in the sitting room and that is where he entertained his visitors. The bedroom in the flat was so small that it was barely furnished with a single bed, a small cupboard, a small table and a chair. There was hardly any space to walk around. In that small bedroom, he spent many years with simplicity and contentment. One of his close friends told me that once Chaudhry Sahibra took him along to show him his flat. As he entered the bedroom he asked, “How do you cope in this small bedroom?” Chaudhry Sahib’s answer was prompt and insightful: “The place where we are going after this life will be even narrower.” How unique is the thinking of spiritually elevated people! They are ever-mindful of the Hereafter and keep preparing themselves for that ultimate, final journey. May Allahtaala bless the jamat with many, many more devoted personalities like Sir Zafrulla Kahn Sahib, ameen.